A Los Angeles car salesman recently spent over $32,000 for the chance to speak with President Barack Obama about the future of electric vehicles. Los Angeles-native Paul Scott is passionate in his support for electric cars. Just how passionate is Scott? Well, the 60-year-old car salesman recently shelled out $32,400—which is more than half of his annual salary—for the chance to make a pitch to President Barack Obama on how to better support electric vehicles, according to USA Today. Scott first became aware of the fundraiser after he received a solicitation from organizers. Prior to withdrawing over $30,000 from his retirement fund, Scott contacted event organizers to make sure that he would have face-to-face time with the President. For his contribution, Scott will get to attend a “private, off-the-record” Democratic luncheon and have roughly 2 minutes to speak directly to the Obama. Aside from a private conversation, Scott and other VIP luncheon guests can have their picture taken with Obama and be part of a special roundtable discussion. Scott told the publication that he plans on advocating for a “carbon tax” that would increase prices on oil-based fuel, which would make electric car prices more competitive. Scott also wants Obama to urge Congress to change the $7,500 federal tax credit for purchasing an electric car. According to Scott, the $7,500 electric car incentive should be instant and not a rebate that is received months later. Lastly, Scott wants the President to be more stringent against opponents of electric vehicles and increase his support for electric vehicle advocacy groups. “I’m getting hammered in the press with all the anti-EV stuff,” Scott said. Obama has been actively pushing for electric vehicle use since his 2011 State of the Union speech when he claimed there would be 1 million electric vehicles on U.S. roads by 2015. Additionally, the U.S. government has pledged $2.4 billion in federal grants to support the development of electric car technology. 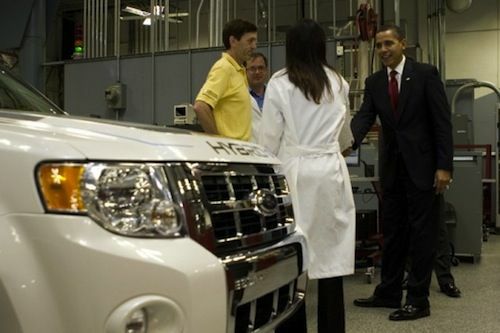 Despite the President’s goal, only about 87,000 electric and plug-in hybrid cars have been sold in the U.S. as of April 2013, according to Bloomberg. Stay tuned for more information regarding Scott’s luncheon with President Obama, which is set for Friday, June 7.